Home » Fillet vs. Filet – What’s the Difference? English has a rich history, entwined with many other languages that lived and died over the millennia. English has adopted many words from its Germanic brethren and Romantic cousins, even from languages (like Latin) that are no longer spoken today. It should come as no surprise, then, that some words have come to be spelled more than one way. Regional branches of English have adopted different spelling conventions, and many cognates exist alongside loanwords that are nearly identical. Filet and fillet can be traced back to French, although they became integrated into English as far back as the Middle Ages. Which version should you use today? Continue reading to find out which is correct. What is the Difference Between Fillet and Filet? In this article, I will compare fillet vs. filet and use each word in multiple example sentences. This way, you can see how the words appear in context. I will also show you how to use a memory tool to make sure you are always choosing the correct word: fillet or filet. What does fillet mean? Fillet can be used as a noun or a verb. As a noun, fillet is a boneless piece of meat. Many people eat fish fillets, for instance. As a verb, fillet means to remove meat from the bone. I’m going to order a salmon fillet on a bed of rice pilaf, and if the restaurant tells me they can’t make that, I am going to cause a scene. The woman on the cooking show filleted a large tuna with the ease and expertise of a seasoned professional. Fillet came to Modern English in the 14th century through Middle English, which borrowed the word from Anglo-French. What does filet mean? Filet is an alternative spelling of the same word. It is closer to original Middle English spelling. Filet is also how the French spell their version of the word. Filet still appears with some frequency in both American and British English, like in the French loanword filet mignon. I am going to find the nearest McDonald’s and order four Filet-o-Fish sandwiches. When Gerard ordered a filet mignon, he became incensed when the waiter delivered the wrong cut of meat. Today, fillet is used much more frequently than filet, except in loanwords like filet mignon and specific menu items, like Filet-o-Fish. In general, you should default to fillet unless you have good reason to do otherwise. 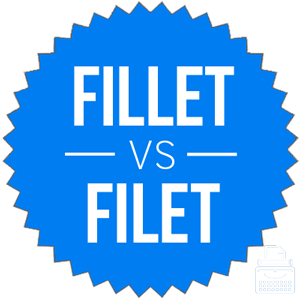 So, what’s an easy way to remember filet vs. fillet? Since fillet has a double L, like the word all, it should be easy to remember to use fillet nearly all the time. Is it filet or fillet? Filet and fillet are alternative spellings of a word that means a boneless cut of meat as a noun, and to remove bones from meat as a verb. Filet is a closer spelling to the word’s origins, but fillet is much more common today. 1 What is the Difference Between Fillet and Filet? Log in or Log on – What’s the Difference?